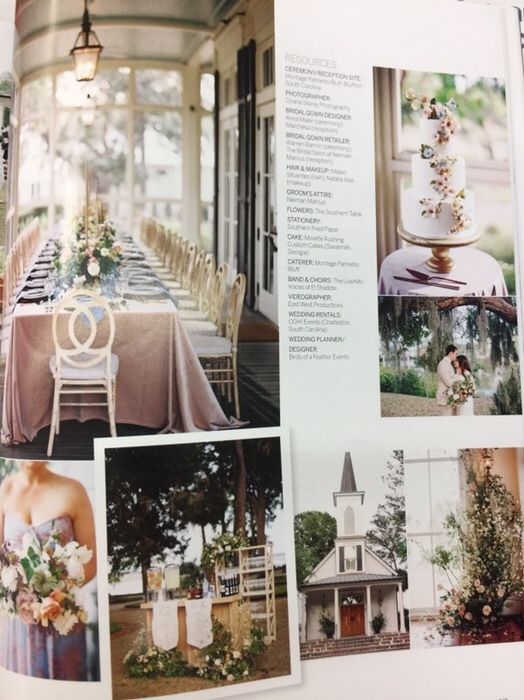 Another wedding was published in D Magazine and I’m just so proud. This celebration was a real joy to work on and the results were simply stunning. 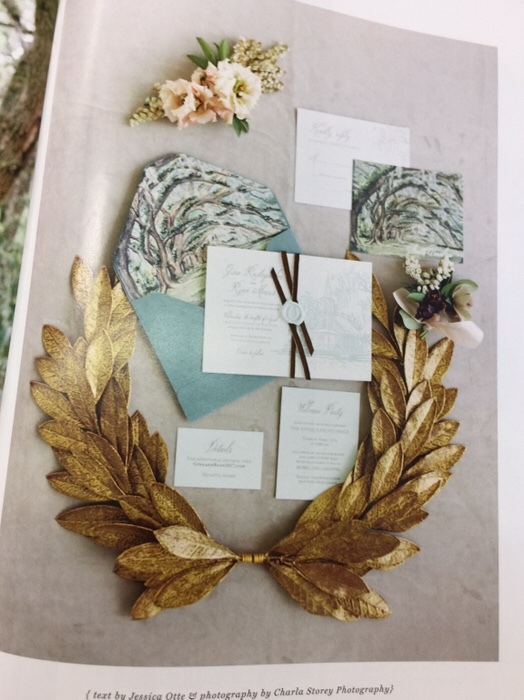 Wendy with Birds of a Feather Events had a design vision and with her carefully selected vendors it came to life. 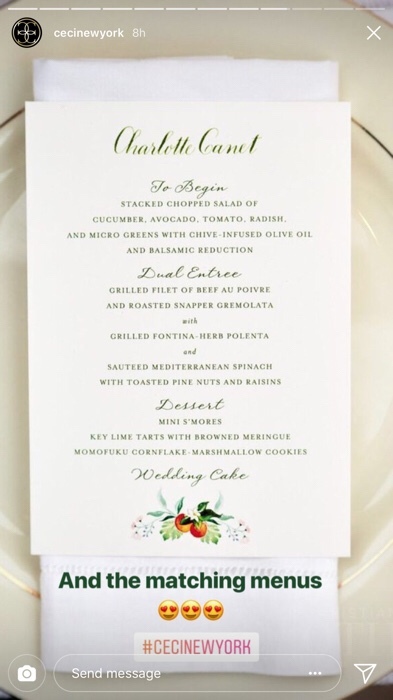 The Southern Table rocked the floral design and Charla Storey captured it all beautifully. 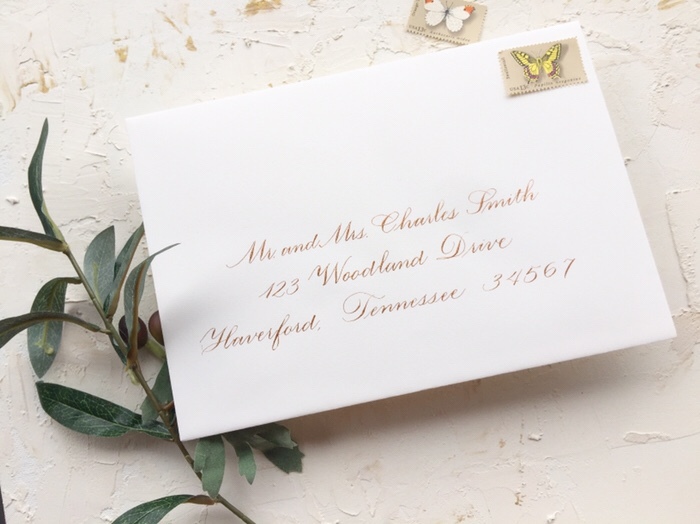 For my part with stationery, I did the envelope addressing to mail off this gorgeous suite by Southern Fried Paper. 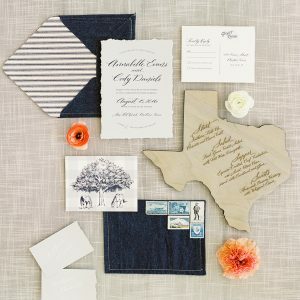 Then I did the menu place cards and scroll seating cards. 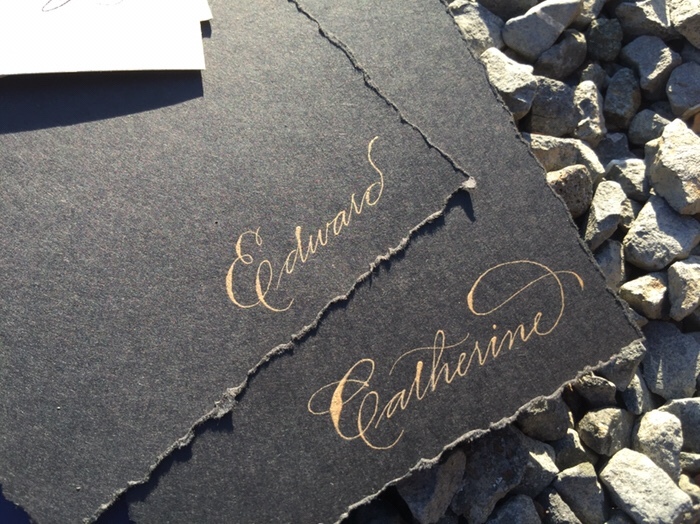 I adore the colors and the classic Rook script chosen. I just love it when my brides are able to share their celebrations. 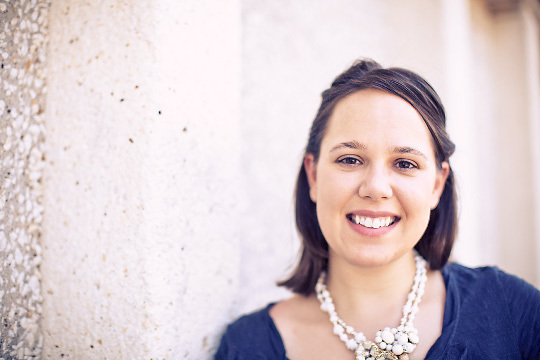 When out Weddings are published in magazines, it is a boost to my portfolio and show potential clients that I operate an established and honest business with a proven track record. So, thank you for letting me share the good news of my little business! 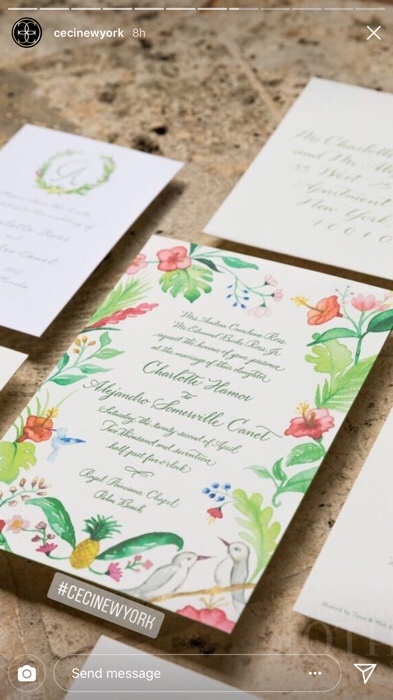 This Charleston Wedding is one for the books. 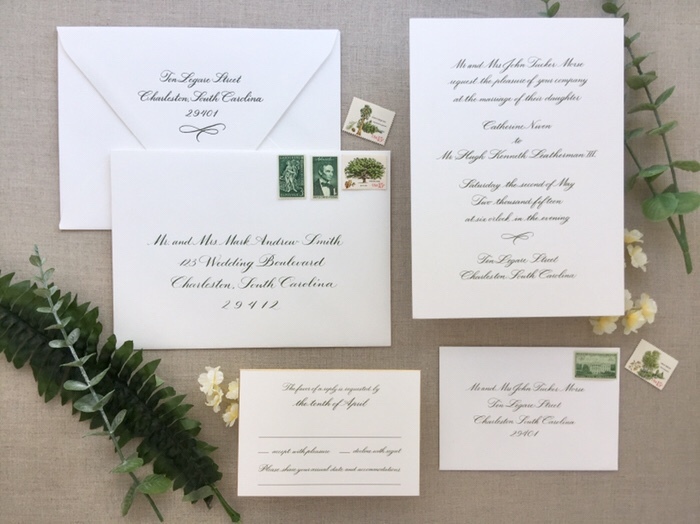 It’s so timeless and classic in my copperplate script, Charleston green engraving and thick white cotton paper. 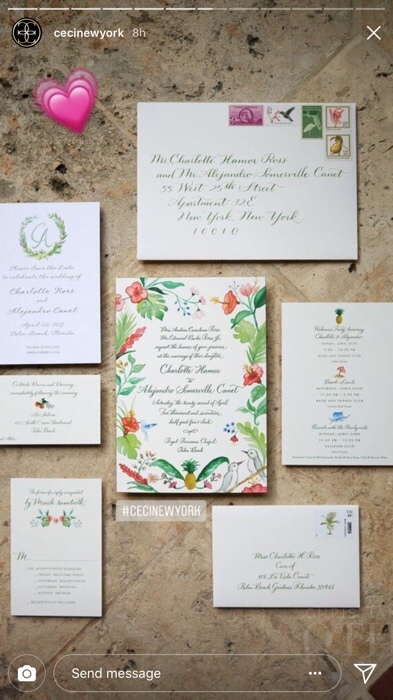 When the Ceci New York team brought me on for this wedding, I was over the moon. Didn’t they do a great job with the design? 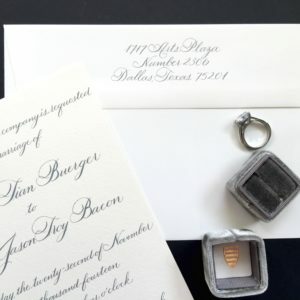 The save the dates coordinate perfectly with the wedding invitations. 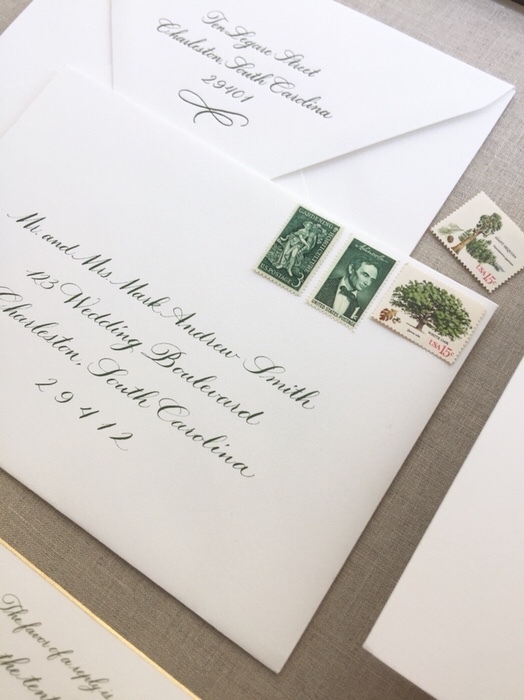 Also in the same classic copperplate script, letterpressed in thick white cotton paper with a stunning watercolor illustration of Charleston on the back. I’m in love! 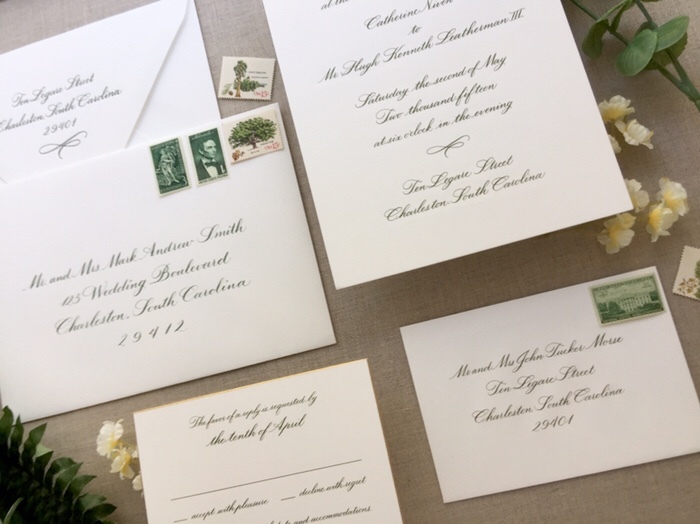 One of my favorite things about this Charleston wedding stationery is that it is forever timeless. It could be a suite from today, 50 years ago or 50 years from now and will never show its age. 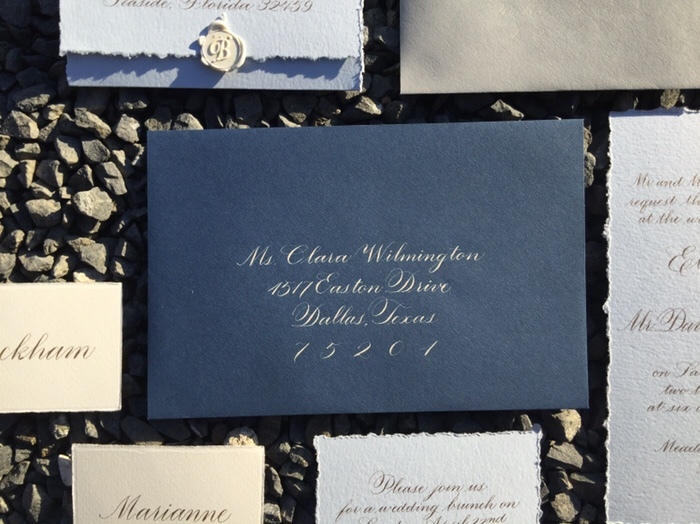 I had the joy of providing a hand calligraphy suite for a styled suite recently to Alex McKinley Events. She gave a general color and the wording but I got to be the creative director on this one. It was so much fun! 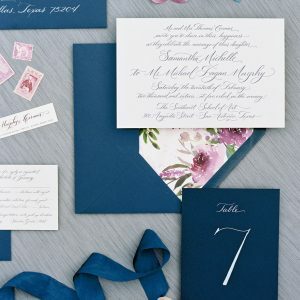 I’m loving the dark blue envelope with the pale blue invitation paper. For a little added dimension, I hand tore the edges. 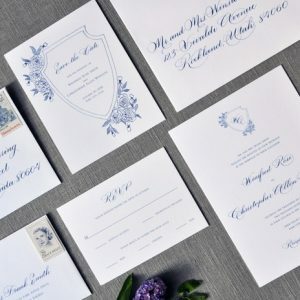 Did you know I offer this service with my custom invitations? 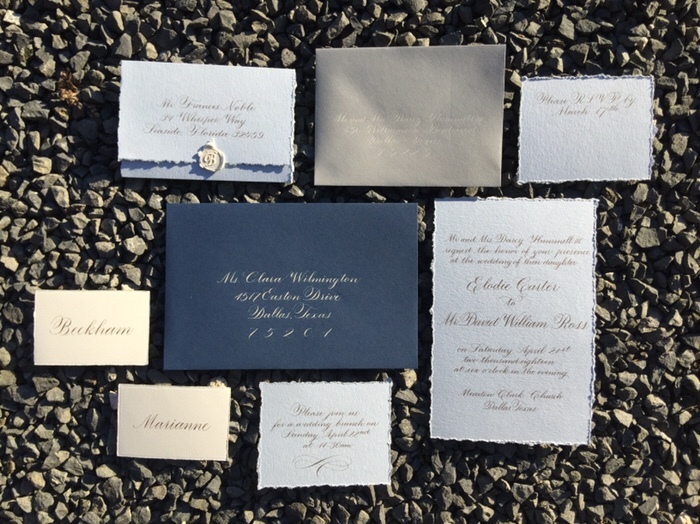 These dark blue envelopes were perfect for creating a bit of contrast while keeping the monotone color palette. 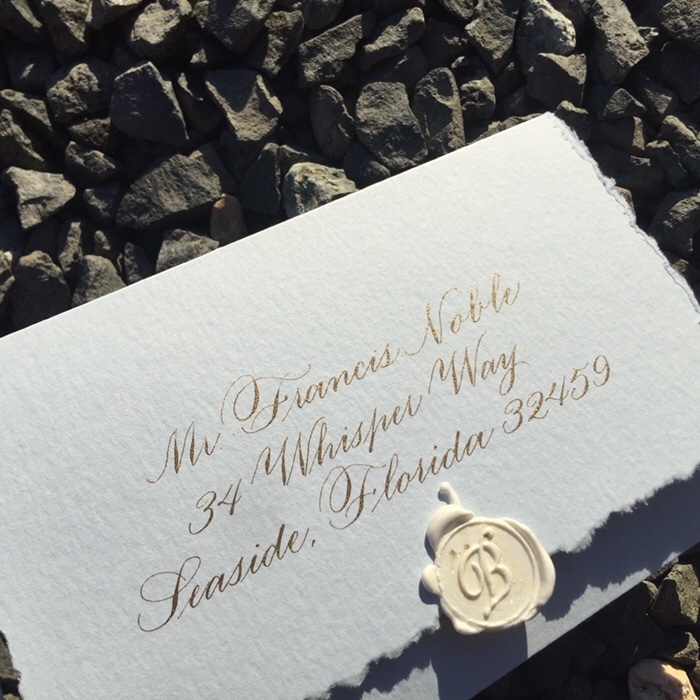 I used ivory ink to be a bit more subtle than white and it worked out perfectly. 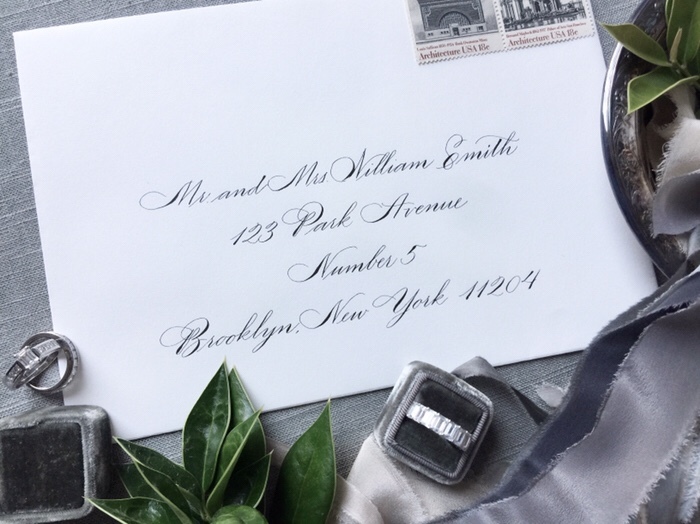 These little place cards were actually rolled up and tied with a ribbon like a scroll. I used my Spence hand on this for a more historic feeling. Still loving the hand torn edges on this one too! 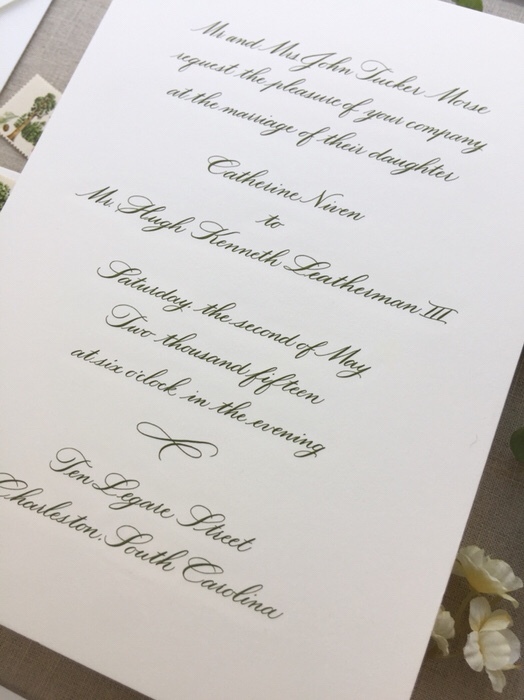 Here is a close up of the wedding invitation. 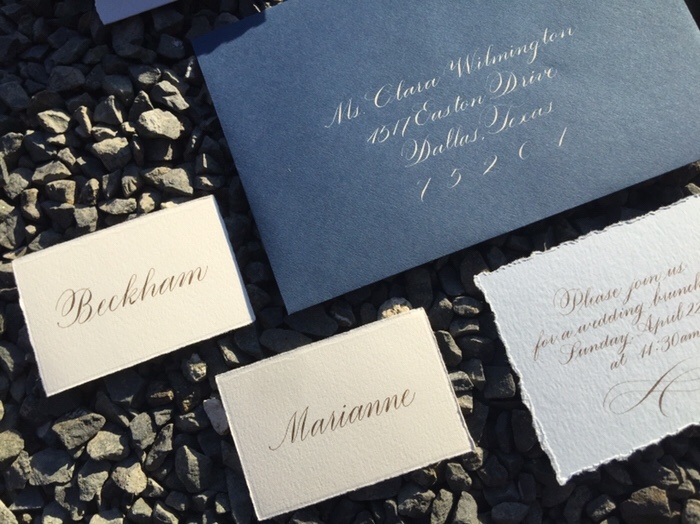 The gold ink really shimmered and I’m fond of the clean copperplate calligraphy. It is elegant and easy to read. I also put together a letter, with torn edges and sealed with wax. It’s so dreamy! Just a photo of all the pieces together so you can see all the texture! 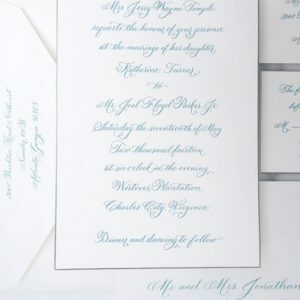 If you are interested in ordering custom invitations – send me an email or give me a phone call!